People Money is a comprehensive guide to the principles and practice of regional currencies. It shows how regional currencies can transform the lives and well-being of local communities, how they can sustain businesses, how local authorities can participate in their success and, consequently, why supporting regional currencies is of vital importance to the future of your community, region or country. 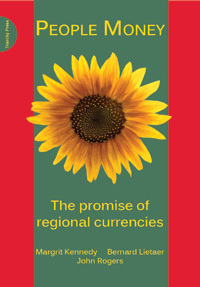 It's also a comprehensive guide to the process of developing and implementing a regional currency.